And it just keeps coming. 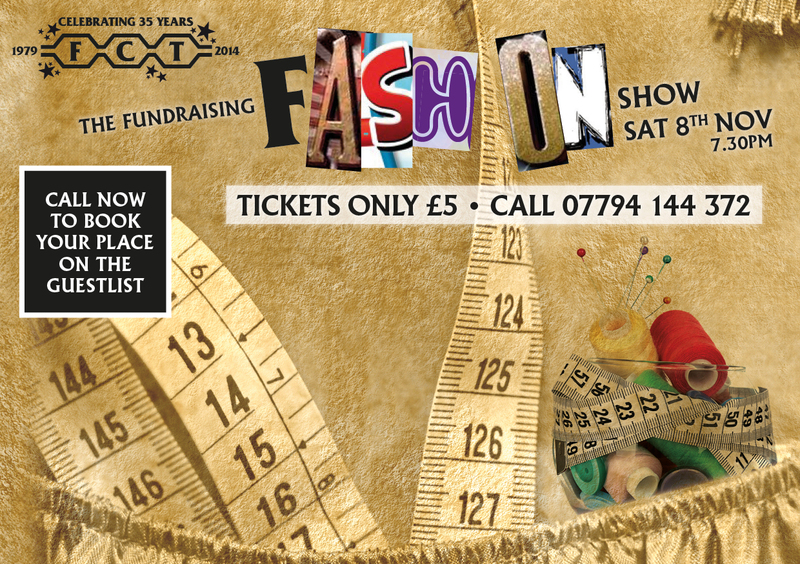 Next up FCT’s inaugural Fashion Show to celebrate our 35th birthday. Jen Jamieson has offered to mount a fantastic fashion show with a twist. All the fashion will be drawn from FCT’s 35 years of costumes. It’s Audrey Stewart’s parting gift as head costume wifie and Sue and Linda are her understudies before stepping out on their own for Thoroughly Modern Millie. It’s a one off spectacular and we only have about 200 tickets so it will be a case of first come, first served. Tickets can be ordered NOW on the FCT Hotline. See the flyer above for details. Should we sell out we may consider a matinee performance as well. But it is likely that ticket demand will be very high so please make your booking as soon as possible. Dress for the occasion of course. For those of you lucky enough to see 12 of our FCT family in action – not to mention probably the same again directing, and performing as adult members and Tempo members – you had a rare treat. 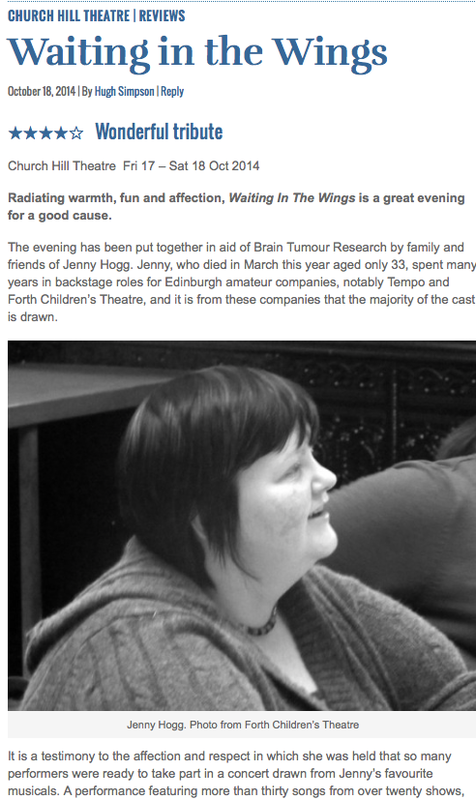 It really was a most moving and fitting tribute to Jenny. Her Piano was used too by the MD. Many of our production team took a very active role and many of the FOH team were drawn from FCT’s ranks so we certainly played our part. Here’s what All Edinburgh Theatre had to say about it. Sad news with the passing of Nancy MacDonald. I have to tell you that a great friend of ours, of FCT’s, Nancy MacDonald passed away last weekend. A number of FCT stalwarts, who knew this delightful woman well, were in Falkirk this morning for her funeral. For those of you who didn’t know Nancy she was the wife of 42 years of Ian MacDonald. Ian wrote a trilogy of plays in the formative years of FCT; Chances, Angel and the very recently reprieved The Chess Game. Ian is one of the people that #FCTFam is most grateful to for his unbridled enthusiasm and devotion. Nancy was always by his side. But no, it was just a coincidence. The Crematorium in Falkirk was packed to the rafters this morning and we enjoyed a simple but beautiful Humanist ceremony with moving, very moving, contributions from Ian and Nancy’s son and daughter. Ian, if we bestowed family fellowships at FCT you’d be right at the top of the list. Please enjoy our welcome forever in the bosom of this family. 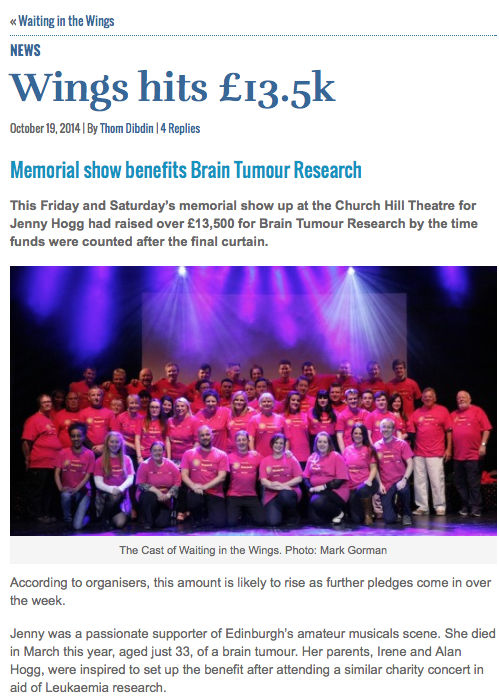 Two great pieces in the media about Jenny’s show this weekend. Secondly a fabulous piece in the Evening News. Tickets tare selling fast so you need to get a move on if you want them. They are available from here.